A fisherman on the Sesan River in northeast Cambodia before the controversial Sesan 2 dam goes operational. Image by Gregory McCann. It was about 9:00 pm when the roar came from the direction of the mountain looming in the darkness. It sounded like a lonely, mournful wail, a love call. There was nothing threatening or scary about it. The next day we changed the memory cards in a dozen or so motion-triggered camera traps used to monitor wildlife. Most of the cameras were set up right on this old access road, which the jungle was reclaiming. Large mammals like tigers and elephants prefer an easy path the same way humans do. We found fresh tiger footprints — including a tiger pug mark set inside of an elephant’s footprint — and both species later appeared in a nearby camera station. 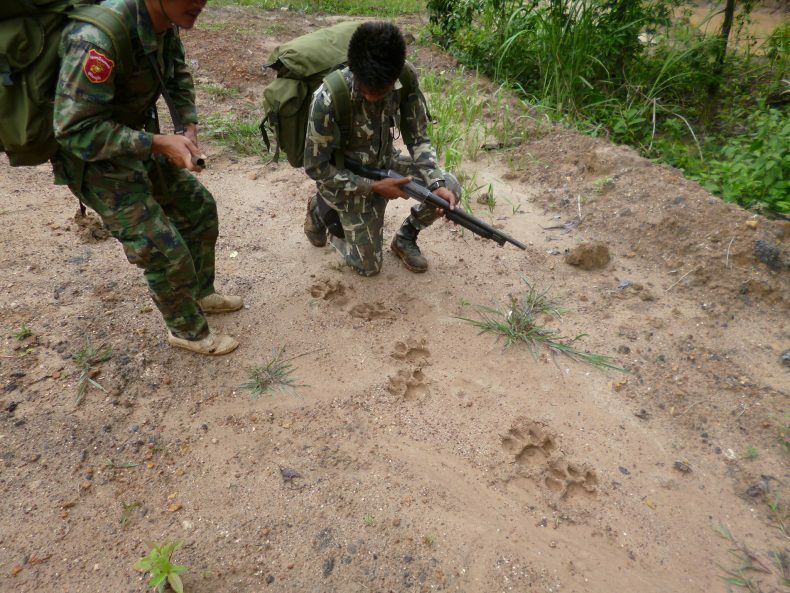 Two forest guards inspect tiger tracks in eastern Thailand. Image by Gregory McCann. That old access road was once a sealed highway that sliced through wilderness connecting Isaan with Bangkok. However, in the 1980s this forest block was declared a national park and a contiguous forest to the south was gazetted as a national park the following year. The road was then decommissioned in favor of wildlife, forming part of what is now known as the Dong Phayayen-Khao Yai Forest Complex, a UNESCO World Heritage site. This is one of the last places you’ll find a breeding population of Indochinese tigers. This sprawling tropical forest dodged a bullet with the closure of that road, though a highway, set to widen and upgrade, and a bullet train whizzing down from Yunnan, China will one day pass close. Other large-scale forest blocks that have survived until the present in Thailand, Cambodia, Laos, and elsewhere may not be so lucky in the coming years. In fact, they may altogether cease to exist. An infrastructure bonanza like none the region has ever seen before looks set to fragment, dice up, and eat into some of the region’s last great wild places, and the prospects for the region’s natural heritage are grim. 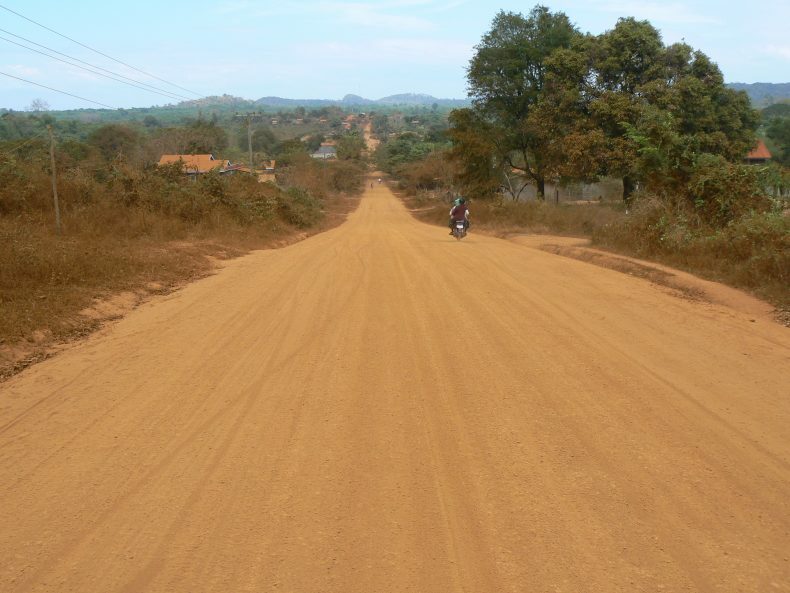 A dirt road in Cambodia’s Ratanakiri province which has since been paved and widened. Image by Gregory McCann. The Dawei Port Project in Myanmar has faced setbacks, but when it is back on schedule the plan is to have a series of roads and rail lines — paid for by Japan and China, respectively — cut eastward across the mountains and forests to Bangkok and beyond. In Thailand, those mountains and forests make up the Western Forest Complex, mainland Southeast Asia’s last great hope for Indochinese tigers and leopards. 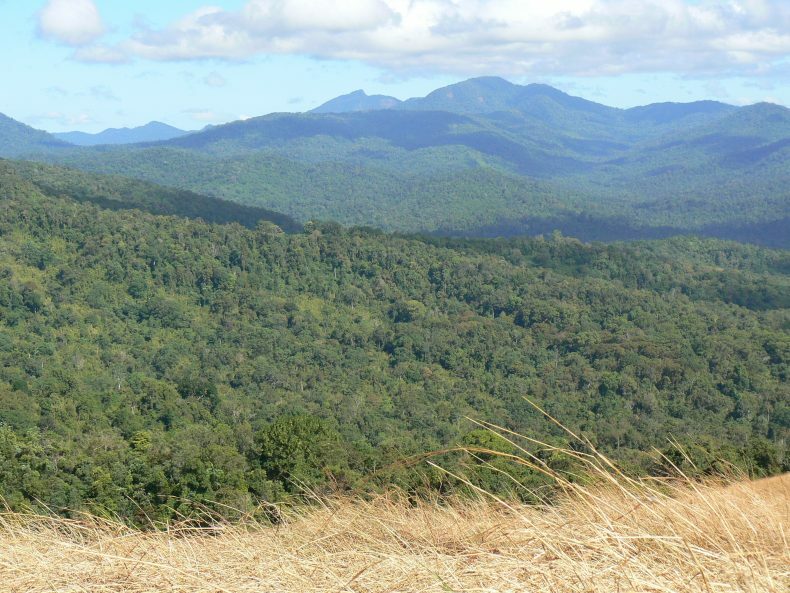 A cluster of 19 protected areas comprise this wilderness on both sides of the border, with the lion’s share on the Thai side. What will happen when highways and railways bisect it? In southern Thailand talk continues about a canal across the isthmus, and in one proposed mountainous route Chinese engineers suggested using nuclear bombs to blast through. That route would skirt the Khao Sok National Park-Khlong Saeng Wildlife Sanctuary landscape, which is a relic of the oldest remaining rain forest in the world. In addition to the digging and blasting required to create the canal one can imagine the series of roads that will be needed to service this construction. The entire region would, from an ecological standpoint, be laid to waste — wherever the canal is actually built. In Laos, a new Chinese rail line connecting Kunming with Vientiane and points south would cut right through a massive mountainous area in the north of the country, an engineering feat that will require blasting, mountain construction, and what will be environmental degradation on an unprecedented scale — to say nothing of the $7 billion dollar pile of debt left for Laos to pay for, a sum that represents 90 percent of the landlocked nation’s GDP. Nam Et-Phou Louey, which was the last site for a breeding population of tigers in Indochina (Laos, Cambodia, and Vietnam), is in the process of having its old existing road paved and widened to facilitate better access with Vietnam. This road cuts directly through the center of the protected area and tigers have not been camera-trapped there in years. 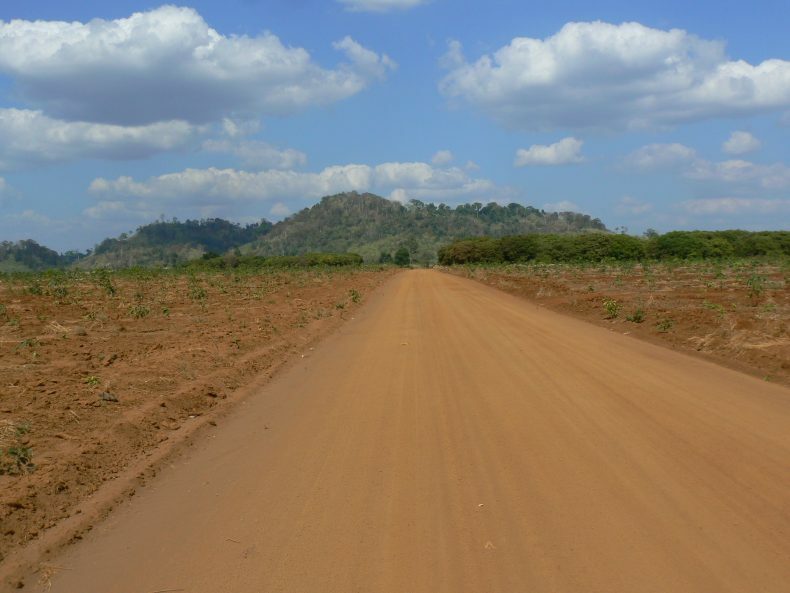 A newly opened road results in clear-cutting for agriculture in northeast Cambodia. Image by Gregory McCann. Laos is also building a series of dams on the Mekong River and its tributaries — including seven financed by China on the Nam Ou River alone in the north of the country — and these dams will block fish migrations, stop needed sedimentation from reaching the Mekong Delta in Vietnam, flood villages and, as the ecology is destroyed, destroy a free source of protein (fish) for millions of very poor people. Nearly all Laotian rivers are slated to be dammed multiple times. Scenic boat rides for tourists will be a thing of the past, and, with illegal logging stripping the nation’s forests faster than anyone can keep track of, the “Land of a Million Elephants” might only, within a generation, be left with a few dozen fit for zoos or work farms. In Cambodia, new roads are being planned or secretly built that few people have even heard of yet. A new “border belt road” that is currently under construction in Stung Treng province has already brought the Lao military into Cambodia in an attempt to halt it as it passes through an undemarcated zone. Worse still, this road is slated to cut through what is currently a completely trackless area of Virachey National Park and will head eastward all the way to Vietnam. There is talk that Laos will build a similar road on its side of the border in a region which is still, at the time of this writing, a forested wilderness. Asian elephants, clouded leopards, golden cats, and many more now-rare species call this Cambodia-Laos borderland home, but their home is about to be altered dramatically. A new road is slated to be bulldozed straight through middle of this forest in Virachey National Park, Cambodia. Image by Gregory McCann. Elsewhere in northeast Cambodia, dams on the Sesan and Srepok Rivers — important tributaries to the Mekong — will displace local communities that depend on those rivers for fish and they will flood the nearby landscape. Furthermore, logging of the catchment flood area is permitted so that trees don’t go to “waste,” but it appears that logging under the auspice of dam construction spreads far beyond the area slated to be flooded. Equally as ominous, the slated Sambar dam on the Mekong — which would be Cambodia’s first Mekong dam — will have similar negative effects in addition to also destroying prime dolphin habitat. Dolphin viewing is Kratie province’s main ecotourism draw; Irrawaddy River dolphins once swam the length of the Mekong and even some of the tributaries like the Sesan River. Siamese crocodiles, river otters, giant freshwater stingrays, Mekong Giant Catfish (the world’s largest, now critically endangered) and many other species once thrived in this vital river ecosystem. The dams will kill the Mekong and its tributaries, creating a series of stagnant toxic ponds behind their walls. And to think that the Mekong is second only to the Amazon River in terms of biodiversity; within a generation it will be silly to even compare them. Down in southwestern Cambodia, China purchased and clear-cut nearly half of Botum Sakor National Park, converting a lush tropical rain forest into a large tourist resort, which has since failed and stands empty and rotting today. Sand-dredging continues unabated in Koh Kong’s rivers, and the government has its eyes on dams for the biodiversity-rich Areng Valley, where prominent local environmental activist Chut Wutty was killed by a security guard a few years ago. Dams in Kampot province have plugged up the natural flow of several rivers there, and Beng Per Wildlife Sanctuary was mostly sold off to rubber interests last year and has since been scraped clean for plantations. 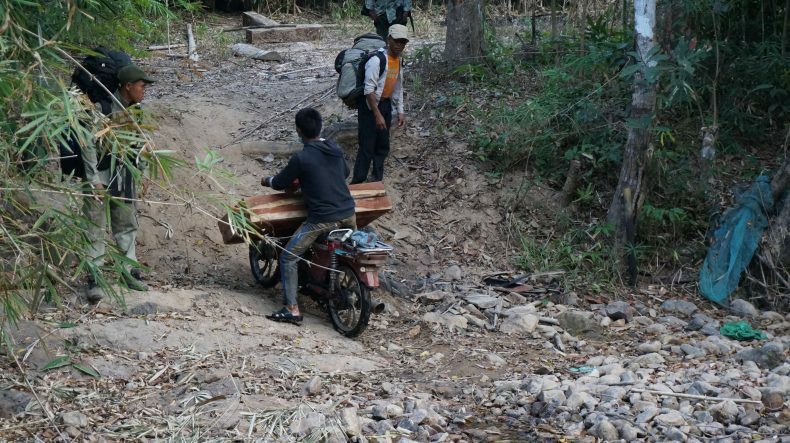 The Vietnamese military has built many access roads in the Annamite Mountains along its border with Laos, opening once nearly impossible to access mountain ecosystems that have since become virtually “defaunated” of their vertebrate mammal community. Meanwhile, Vietnam has invited highly polluting petrochemical companies from Taiwan to invest in factories. A recent high-profile case saw one such factory discharge massive amounts of raw chemicals into the sea, which killed off nearly an entire coastline of fish. Vietnam’s wild elephant population is down to just a few dozen scattered individuals and there is talk of moving them to Cambodia where they can join more viable populations. Vietnam put a cable car up atop its tallest mountain — Fansipan — destroying all natural aesthetic, while new cable cars planned for Song Doong Cave — the world’s largest — threaten this delicate subterranean ecosystem. A cascade of dams on Myanmar’s currently un-dammed Salween River will displace ethnic communities, wreak havoc on wild ecosystems that contain some of the last substantial populations of the region’s wildlife, and have the potential to bring about violent conflict with rebel groups. Like Laos, Myanmar has plans for major dams on the majority if not all of its rivers. Fresh water, the source of life, is now seen as the source of electricity, most of which will be exported to China and Thailand (in both cases of Myanmar and Laos). 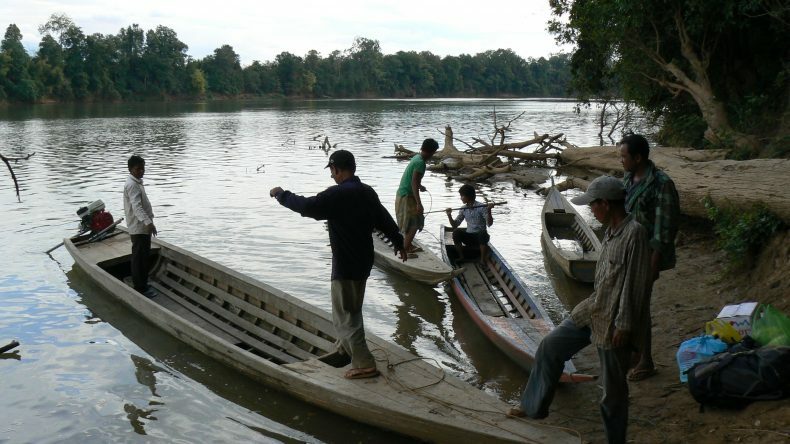 Rivers are vital sources of food and transportation in Indochina. Image by Gregory McCann. In Peninsular Malaysia, Chinese developer Country Garden is building a massive new city called Iksander Forest City near the border with Singapore. A population density greater than New York City is expected for this place, and the sea turtles that once came ashore to lay eggs on the coastline will have to find somewhere else to go. A staggering system of proposed railway lines will further fragment and pixilate the region’s landscape. The envisioned rail network would see a multitude of lines linking Rangoon, Dawei, Bangkok, Vientiane, Luang Prabang, Chiang Mai, Pattaya, Phetchaburi, Phnom Penh, Siem Reap, Battambang, Ho Chih Minh City, Saigon, and Hue, all the way down to Surat Thani, Ranong, Phuket, and then over the new canal and on to Kuala Lumpur, Johor, and Singapore — and this is an abbreviated list that does not include new ports, pipelines, bridges, toll stations, airports, resorts, and other development schemes. And the plans continue into island Southeast Asia with rail lines dreamed up for Sumatra, Java, Borneo, and even Sulawesi and Mindanao. Much more text would be needed to describe the development schemes planned, in the works, or which have recently been completed in Sumatra (I have nightmares about a tunnel going under the Malacca Strait to connect this island with Malaysia), Borneo, Sulawesi, and Papua New Guinea. And all this is to say nothing of the fake islands that China has built on reclaimed reefs in the South China Sea, which are an ecological catastrophe; in addition to destroying the reefs and the breeding grounds for fish, who is able to keep track of all the sea turtles, sharks, manta rays, whales, and whatever else Chinese fishermen are pulling out of there? The South China Sea, which was one of the world’s most productive fisheries, will become a dead zone of military outposts where soldiers from various nations guard offshore drilling sites that pollute these shallow seas. Poaching is on the rise across the region. 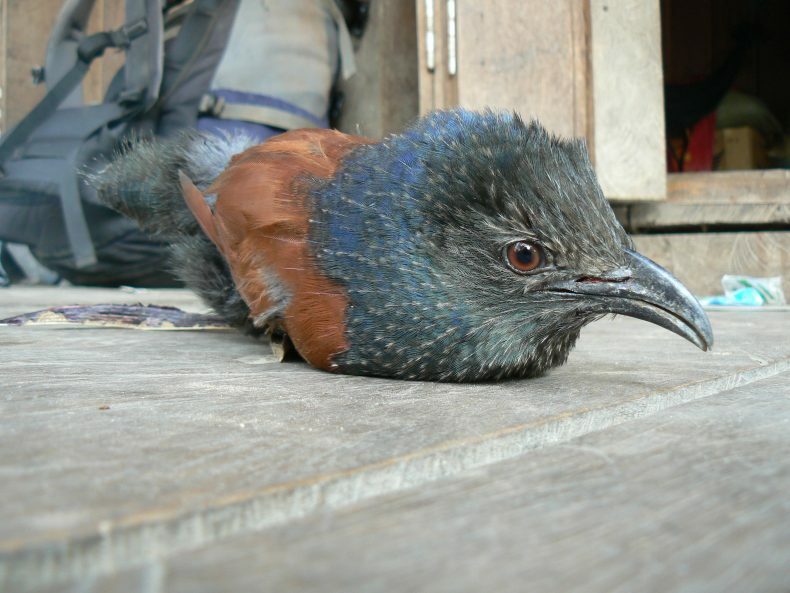 Here, a greater coucal awaits its fate in Cambodia. Image by Gregory McCann. From an environmental standpoint, these new infrastructure plans will likely sound the death knell for much of the region’s remaining wildlife. New roads, rails, dams, and ports are usually about the transportation of raw materials and resources, which means resource extraction. That means that somewhere trees will be cut down, minerals dug up, oil pumped out from the ground or sea, mountains blasted apart, wildlife hunted out, land sold, products shipped. Remaining natural habitats will be sliced open, bulldozed, and chipped away at for these projects, followed up by the negative cascading effects of colonization, subroad building, hunting, logging, plantations, and other commercial developments in what was previously nearly inaccessible terrain. Who or what is behind all this? You could simply answer with “globalization,” but that’s vague. One possible answer is China. It is China that is pushing so hard for the rail projects, exporting its excess capacity at home and its “expertise” in the form of an army of workers and engineers into Southeast Asia (and these workers often drive poaching trends in the nearby forests and mountains where they are working). China has already largely trashed its natural environment and built all the roads, rails, bridges, and new cities it needs (and many it doesn’t need; new Mekong dams in Yunnan are slated for construction on a stretch of the river that already has many dams on it). Might the new wave of sinicization of Southeast Asia be about to liquidate and transform the environment to make it “more like China” — in other words, make it a place of empty, fragmented forests, degraded mountains, and very few wild animals? Illegal logging is made easier by access roads. Image by Gregory McCann. A systematized landscape scraped clean of its natural vegetation and replaced by cement, factories, dead rivers, polluted lakes, and smog-choked cities — is that what the future holds for the rest of Southeast Asia? China’s Belt and Road initiative — if it ever really gets off the drawing board — would see this kind of environmental transformation on an epic scale. There is a saying in Chinese – “漢化” which translates to “transform into Han Chinese.” This is what happened to the ethnic minorities who lived on the periphery of the ever-expanding Han empires in what are now China’s southern provinces, such as Yunnan, Guizhou, Guilin, and others. Is something similar happening in Southeast Asia today? I have had the great pleasure of spending a good amount of time in the jungles of Thailand, Laos, Cambodia, Malaysia, and Indonesia, and I know that the wildlife that has evolved alongside humans throughout the ages deserves to have a future the same way that humans deserve a future. Humans are not listed by the IUCN as endangered or critically endangered, but Indochinese tigers are, pileated gibbons are, Indochinese leopards are, and many more denizens of Southeast Asia’s rapidly shrinking wilderness areas are as well. The development schemes listed in this article are just a fragment of the total in the pipeline. They may sound enticing, but the development of roads, ports, and rail lines rarely in and of themselves lead to prosperity; in fact, degradation, displacement, and poverty often follow. Southeast Asian governments would do well to carefully weigh their options when considering these development proposals. Change is not always good. Going from cancer-free to having cancer is change, but that is the kind of change that no one wants. These aren’t the kinds of projects that the forests can reclaim; there will be no tigers roaring in the night in a few decades from now if these projects are built. Gregory McCann is an Assistant Professor at Chang Gung University in Taiwan and the Project Coordinator for the wildlife conservation NGO Habitat ID. This commentary is reprinted with permission from The Diplomat and represents the views of the author only.